I´m going to be a bit negative about Galapagos here, reason being, I don´t think that people know what they´ll get and go there with huge expectations. I also don´t think that Galapagos should be visited by tourists who don´t really care about animals, nature and preservation, who don´t know or care about endangered species and how humans impact them, because this is exactly what Galapagos is about. Most of the endemic animals are endangered because of humans using their land, bringing pests and non endemic animals and plans to the island and killing them for food (yep, even today, some locals kill giant turtles for food). Thorns. More thorns, even the animals have them. Galapagos is a harsh environment. So if you like fluffy cute animals and think that they are here for your pleasure and think that you´ll get this at Galapagos, then you shouldn´t go there, it´s nothing like that. I´s not Disneyland, created to please (camera) trigger happy tourists. (any Galapagos enthusiast reading this, please excuse my ignorance with chucking all the different species into such buckets, this is intended to sum it roughly up for the rookie). 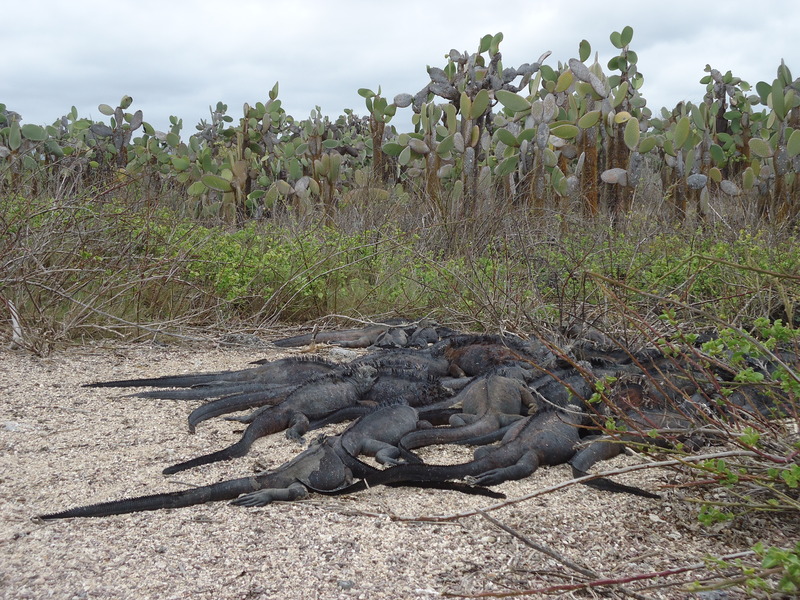 Mostly, you´ll see big marine iguanas lying in the sun and lots of crabs. The terrain and nature are beautiful, if you know how to appreciate untouched and hostile nature. If you like human built picnic areas with toilets and bins, then you shouldn´t go to Galapagos. They are there of course, but they also destroy the animals habitat. It was sad to see how much rubbish there is everywhere – if one dickhead can throw rubbish around even in Galapagos, I don´t want to know how they behave in other natural environments. I don´t think I visited a single place without seeing a plastic bottle or other rubbish stuck somewhere in the mangroves. Even worse, the town is actually very clean, well, the touristy part. As soon as you walk beyond the nicely done pavements, you´ll see more rubbish (typical for rural life here, people don´t have that many options to get rid of stuff, so dump it in their backyard). The inhabited parts of Santa Cruz, San Cristóbal and Isabela are also growing, eating into the natural habitat, to accommodate tourists. There´s all types of industry, petrol stations, farms and many locals to support the tourism industry. And where´s industry, there´s destruction of nature, animals killed on the roads etc. Yes, I am one of the tourists too. I am not saying that people shouldn´t go to Galapagos. I am saying that people who don´t care about nature shouldn´t go to Galapagos. This isn´t just a place to visit, so you can make your friends envious, it´s a unique (one and only in the world!) place, where nature was untouched by human influence, only people who are aware of that and can appreciate it, should go there. Giant turtles were living there for ages, now that humans found the islands, in a few hundred years, we have managed to drive them to close extinction and need to grow baby turtles in breeding centers, then release them back into the wild. I wonder what would happen, if we removed ourselves from all the islands and just kept a monitoring station there. Would they recover to their previous numbers? I wish the answer was yes, but with the numerous pests we brought to the islands (rats, cats, dogs) that eat their eggs, they would probably still go extinct. Thinking about going to Galapagos? Think about it twice. What is your reason for going? Are you going to take loads of lovely pictures to show to your friends and family, be able to boast about visiting a cool place and maybe leave the odd plastic bottle in the bushes? Or will the visit help you understand the importance of preservation of nature and animals and change your habits, so that you impact their environment less, maybe even spark off an environment related idea or a project that will help nature or animals elsewhere in the world? Pingback: Galapagos on your own « Kam ma nos zavedie..